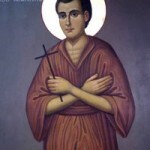 A holy anniversary has recently been celebrated in Greece: this past 24th of August marked the passage of 180 years from the very day on which a glorious son of a Northern Epirian village on the shore of the Apsus River, next to the city of Veratios, finished the course of his life as a martyr. His very name – Kosmas that Aetolian (1714-1779) – continues to stir us even today. Newspapers and periodicals of both the Capital and the provinces published articles marking this anniversary, however, as one journalist has remarked, most of these do not paint a true picture of Saint Kosmas. Each attempts to shade the picture according to his own preferences, thoughts, and sentiments so that the ideas of worldly circles have found expression through the mouth of the saint: were he alive today to hear these things, the saint would be distraught, seeing that the meaning of his struggle had been so manipulated and distorted. For example, because in some exceptional case the saint allowed the materials from a destroyed church to be used in order to erect a school, the conclusion has been drawn that Saint Kosmas did little more than destroy churches in order to build schools. Who did this? He who, if he commended learning, did so solely as an aid to moral and religious man’s formation, saying that the school ought to open the way to the Church, to monasteries? 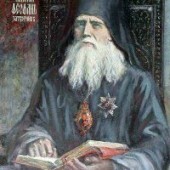 Thus any school which lacks a religious foundation, which does not have as its foundation the great commandment of love – love of both God and neighbour – but which is instead cold, indifferent, an enemy of the true faith, this school has become destructive, it has fallen away from its true end, and is dynamite to the foundation of Orthodox community. As the Saint has prophetically said, “Great evils will come to humanity through those who are well read.” In another case, because Saint Kosmas sought to stop the flow of sin and immorality, checking the lack of compassion and the injustice exhibited by the wealthy and those in the community who held high offices, some drew the conclusion that the Saint was nothing more than a social reformer, suggesting that he was simply engaging in class conflict, rousing the weak against the strong. In yet another case, because he checked certain shortcomings of the clergy, and even of the hierarchs, there were those who concluded that Saint Kosmas was against the hierarchy. Since he spoke in the language of the people – thus say the proponents of the ‘vernacular’ language – Kosmas was a demotikistis, who thought that the world would be saved through language! Finally, judging from certain of his sayings and actions, others said that he was an agent of foreign powers, of the Muscovites, and that he was in league with Orloff and his movement (1770). This accusation was used against him primarily by his enemies the Jews. 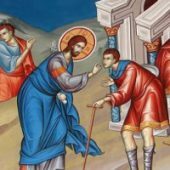 How limited was their understanding of Saint Kosmas! Saint Kosmas was certainly a multi-faceted personality, like a multi-faced diamond. Each face of this spiritual diamond, however, reflected the same light; the unfading light of the Resurrected Lord. 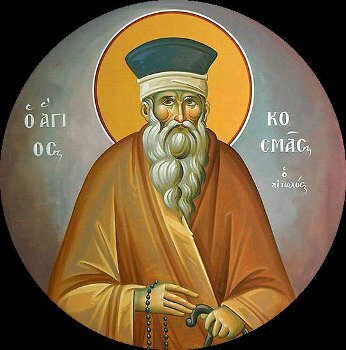 At the depths of his being, Saint Kosmas was purely spiritual, purely evangelical, and purely metaphysical; he was an ambassador of God, an apostle of Jesus Christ. He was a true missionary, fulfilling the commandment of the Lord to, “Go ye therefore, and teach all nations,” a commandment which has yet to be fulfilled in many corners of the earth. How many millions of people await new evangelists! The century within which St Kosmas lived and suffered martyrdom was one of great trial for the Orthodox Faith, for Christianity in the East. Satan, to use the expression found in the Gospel, held the sifter and was sifting the Christians of that era (Luke 22:31). His tools, the lesser and greater rulers of the Ottoman Empire, all fanatical followers of Mohammed, pressured Christians to abandon their faith in a variety of ways. With little cause these rulers seized thousands of Christians, putting them in prison. The iron-clad doors of these dreadful jails would only open to free prisoners once they had denied their faith and shown themselves to have embraced the religion of their false prophet. In addition, heavy taxes, difficult to bear, and which had to be collected no matter what, were laid on the shoulders of Christian slaves. From these there existed only one means of escape – conversion; in other words, he who was free of these taxes was he who had converted. The eunuchs of the Sultan’s palace snatched the most beautiful young Greek girls from the arms of their mothers and entrapped them in dens of debauchery – the notorious harems. Officers of the Ottoman army rounded up the Christian’s healthiest and most intelligent children in order to make them Janissaries. Under such pressures, weaker characters broke: not only individual, but even whole families and villages, together with their priests abandoned their faith. It is no exaggeration to suggest that many Turks living in the wealthiest areas of Asia Minor today are the direct descendants of Christians who betrayed their faith. The ever-memorable Chrysanthos, Archbishop of Athens, and former Metropolitan of Trebizond, writes, “…none of Turkish descent are found in the whole area surrounding Trebizond, nor even within the more expanded circumference of Chaldia. All of these (Turks) are Greeks, descended from Greeks. All of these people, as a whole, renounced their faith.” Islamification proved particularly serious in Macedonia and Epirius, but above all in Albania where the number of Christians was reduced from 550 thousand to 50 thousand – and even these stood in danger of falling away. Those who remained stable in the faith of the Fathers met with harsh persecution, often spilling even the last drop of their blood in martyrdom: during this catastrophe in Asia Minor, Christians were like marked sheep. In all, the number of these new martyrs totals 2.5 million. At the end of the 18th century (concerning which we have been speaking), a most ferocious beast, Sultan Mustafa IV, appeared on the forefront of history. He conceived of a satanic plan for a new Babylonian exile, to move, in other words, all of the Christians from Greece into the Middle East, to Mesopotamia, and to settle in their place violent peoples – the Abkhazians, the Cicussians, and the Kurds. Had this plan been successfully carried out it would have meant the complete annihilation of Christian Greece. The sons of Satan conceived of a plan for the complete eradication of the Orthodox Christian world and sought to execute it. The most-high God, however, who planted the tree of Orthodoxy that it might flower and bear fruit, and that under its shadow the weary and heavy laden of all ages might find rest, did not allow these plans to come to fruition. For this task God chose the right tools, breathing a spirit of zeal, of holy enthusiasm, of self-denial, of courage, and of wisdom into certain souls, and sending them out as new apostles, and evangelists wherever the faith was in danger. One of these tools selected by Divine Providence was Saint Kosmas. 3. St Kosmas in historical context. Where was Saint Kosmas during this dark period of the Orthodox Church’s history? 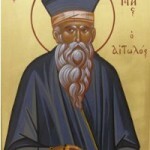 He lived in the desert of the Holy Mountain, having taken up the monastic life in Philotheou Monastery. Oh, how beautifully he spent those days of his life! Psalmody, vigils, the reading of the Scriptures and the writings of the Fathers, conversations with holy brethren and spiritual guides, and, above all, communion with the Heavenly Father through noetic prayer. These things created an ideal spiritual climate which was reminiscent of the summit of Mount Thabor. Here he was far from the noise of the world, from the tempest which raged in the cities and villages of the Orthodox. As far as he was, however, the heartbreaking cries, the lamentations of the countless Christians who suffered various forms of martyrdom reached his ears. Sorrowful news arrived each day, telling of the havoc Satan was wreaking everywhere, but especially in Macedonia, Epirus, and Albania. Orthodox Christians were abandoning their faith, trampling on the Lord’s cross and bowing before the crescent moon of Mohammed. 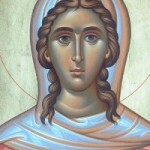 Saint Kosmas was unable to remain indifferent in the face of all this. In solitude he began to think: “Am I to remain here on the summit of a mountain, immune to the torment and suffering while those in the foothills, in the villages and cities, are suffering martyrdom? Should I not be rushing to their aid? Yes, I help them from here by my prayer, since praying for others with faith and a pure heart is equal to contending for the faith, but in the case of such harsh trials is not some active participation required? Do those in prison not stand in need of visitation? Do those brethren who are afflicted not need personal contact, a comforting word, some small advice, some display of mercy – one tear shed in solidarity with those who are suffering – are these not invaluable contributions to the struggle for the faith? Am I capable of such a mission? Will I be a help, or will I just cause more harm? Do I have the strength to withstand the temptations of the world? Is there a danger that I will lose my own soul trying to save the souls of others? What am I to do, Most High? ‘Cause me to know, O Lord the way wherein I should walk'”. Saint Kosmas wrestled with his thoughts. Now in agony, he had reached his life’s Gethsemane as happens to every man who is called to undertake a significant mission in the world. A bitter cup has been prepared for him. In his anguish, the voice of God provided him with an answer to his question. Opening the Scriptures, his gaze fell on a line from Saint Paul which read, “Let no man seek his own, but every man another’s wealth”. 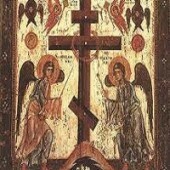 The line cast heaven’s light on his heart; it was as if the Holy Spirit was saying, “Kosmas! Think not solely of your own spiritual advantage, but also of that of your brothers. This requires that you leave your hermitage, take up your walking stick and launch yourself into the great tasks of leading souls to the Gospel. The illumination which he received through this scriptural saying alone was not enough to satisfy Saint Kosmas, however. He desired to see if he had properly understood the Holy Spirit’s advice. 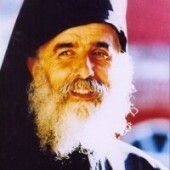 He sought out the advice of spiritual fathers, and even travelled to Constantinople to visit Patriarch Seraphim, expressing to him his innermost thoughts and desires. The Patriarch approved his plan and provided him with written permission to preach. Now convinced through the voice of his conscience through the voice of the Scriptures, through the advice he received from spiritual fathers, that he was called to work for the salvation of souls, Saint Kosmas departed for his mission. 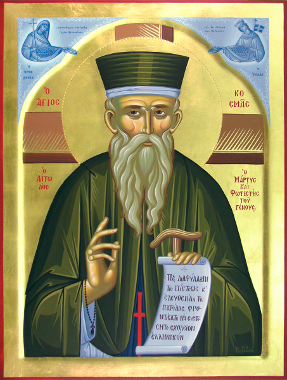 To battle Lucifer, to battle the beast on his own ground, to awaken the oppressed conscience, to console, to wipe away tears, to rouse the mind, to stir the emotions of the faithful, to stop the wave of Islamification, to exalt the horn of the Orthodox Christians, and ultimately to fall in defense of the faith: behold, Saint Kosmas’ mission! Saint Kosmas would indeed fulfill this important mission; through this faithful servant of God consciences were awoken, minds were roused, emotions were stirred, and the wave is Islamification was stopped. How did he do this? What was his method? What means did he use to fulfill his holy aims? One might ask, ‘What kind of preaching’? Did he employ the kind in which the preacher tries to wow his audience through rhetorical devices and fireworks? What kind of preaching? The kind where the preacher employs lofty language, inaccessible and incomprehensible to most people? What kind of preaching? The kind which is continually speaking of social problems and never turns its attention to the most central of matters, the kingdom of the heavens? No! Saint Kosmas’ preaching bore the mark of genuine apostolic preaching. First, that which the Apostle Paul said concerning himself together with the remaining apostles, that, “we also believe, and therefore speak,” is fully applicable to this holy man. Saint Kosmas believed in all the saving truths of the Orthodox faith. “I have read much concerning the Jews, the impious, the heretics and the atheists. I have studied the depths of wisdom. This I understand to be true: the faith of the Orthodox alone – to believe and to be baptized in the name of the Father, the Son, and the Holy Spirit – this alone is good and holy. 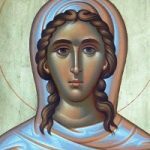 To conclude I tell you this: you ought to rejoice in the fact that you are Orthodox Christians and weep for the impious and the heretics who are in darkness.” He preached this faith with impressive simplicity, with such simplicity, in fact, that even children were able to understand him. He preached with emotion. He preached with tears. He preached in the shadow of the Cross. He cut the spiritual bread into small pieces and distributed it to all just as the priest distributes Holy Communion, the precious body and blood of the Lord, with the holy spoon. The one who preaches the Gospel truly undertakes a holy work. United to God through prayer, he knew how to communicate to the souls of his listeners for whom his words represented spiritual elation. Even today, whoever reads his teachings, which were preserved by his disciples, feels as if he has been grasped by a spiritual power, lifted up above the earth, and transported to some spiritual and immaterial world on the wings of eagles, on the wings of angels. Such was the impression that this simple preaching – simple but yet endowed with the power of the Holy Spirit – created. Thus, with tears in their eyes his listeners entreated him to remain with them and speak again, while thousands of laymen and clergy followed him great distances, not wanting to be deprived of such a precious preacher of the Gospel, such a director of souls. 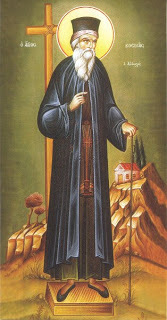 Saint Kosmas did not rely on his preaching alone, though it reached thousands of hearers. In imitation of Paul, the leader of the apostles, who giving a brief apology for the work of the apostles in Ephesus said, “by the space of three years I ceased not to warn every one night and day with tears,” and following the God-man who beside the Well of Sychar had an audience of one lone soul, the Samaritan woman, Kosmas taught each person individually, as much as it was possible. During the period of his missionary work, he came into contact with people living in a variety of conditions. He conversed with the poor, but also with the rich and those who held office at that time. He even held conversations with men of other religions. 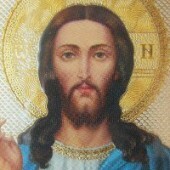 This he did with one sole aim: to enlighten, to save, to draw each soul out of darkness and towards the glorious light. He had a great talent for speaking to souls; he was able to communicate with ease and precision. He also held the secret to answering each person with what was useful and necessary for him particularly, and for informing the mind, and comforting the heart. As a well-experienced doctor, he correctly diagnosed spiritual illnesses and prescribed the right medicine in its proper dosage. Let us here make mention of two anecdotes taken from his years as a missionary. Besieged by an illness which no doctor could cure, a certain Bey turned to the Saint for help. Saint Kosmas listened to him with great attention and after some thought said, “Listen to me! If you want to be cured the first thing you must do is stop drinking raki (for the Bey was an alcoholic), second, in proportion to the evil that you have done, you must now do good, and third, you must ever be giving charity – at least one-tenth of your goods.” The Bey was worried, particularly on account of the first medication prescribed by the Saint, i.e., that he cease from drunkenness and from the consumption of alcoholic drinks, but in the end consented. After demonstrating that he has heeded this advice, he was cured and thus became an admirer of the Saint. On another occasion he met a band of thieves, the leader of which (followed by his band) approached to kiss his hand. Such devotion breathed even within these savage natures! Seeing this devotion, the Saint offered them spiritual instruction and the thieves were moved by his advice. What was the result? Laying down their weapons, some left to take up the monastic life, lamenting the evil they had done, while others went on to live a quiet life in the world, amongst those Christians from whom they had previously stolen. Following in the footsteps of the Apostle to the Gentiles, who, writing to his faithful disciple Titus, advises him to continually exhort the faithful to good works: “And let ours also learn to maintain good works for necessary uses, that they be not unfruitful.” Thus the Saint too, having the heart of a father, continually urged his listeners to do good works. He felt the pain of others; he suffered together, and was crucified together with the Lord’s people, who daily suffered a myriad of crucifixions. He felt the needs of the Christian community – both spiritual and material – as if they were his own and heard the cries of pain issuing from those who were experiencing hardship. Moved by the sight of human sorrow, the Saint, spoke artfully, plucking the heartstrings of his listeners, inspiring sympathy in them, rousing philanthropic sentiments in them like no other and moving them to work for the common good.